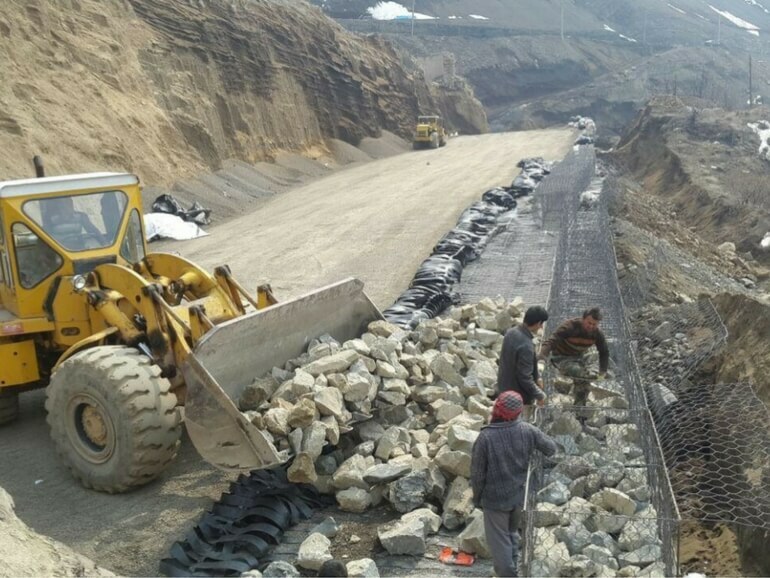 Our innovative “ParaMesh”, MSE Terramesh System wall with ParaLink primary reinforcement geogrids, was chosen to build a 33m high and 300m long retaining wall at km 14+700 of the new Tehran-North Highway. “ParaMesh” prevailed over other solutions, such as a bridge or a traditional concrete wall, for its cost-effectiveness and ease of installation. Construction is ongoing and is expected to be completed in October 2017. The Ministry of Roads and Urban Development is working to complete the construction of the highway connecting Tehran to the Northern province of Mazandaran. The highway project, comprising four different sections, commenced 20 years ago and will cover 121 km when completed. Section 4 starts from Marzanabad in the Kelardasht District, Mazandaran Province and is approximately 20 km long. The construction of this element started in 1996 and has gradually been completed. Section 1 is 32 km long. It starts from the cross section of Azadegan and Hemmat highways, continues passing through Kan, Soleqan, Emamzade Aqil, Taloon tunnel (4,850m long, this is the most important structure of this section) and Laniz valley and reaches the Shahrestanak junction. Once completed, the current path passing through Karaj will be omitted and the route to the Northern provinces will be shortened by 60 km. The completion of this section is of high priority and is set for the second half of 2017. Works on sections 2 and 3 will start when section 1 will be completed. These are not easily accessible due to the several twists and turns in the unfriendly mountain terrain. Section 2 connects Shahrestanak and Zangoole bridge. This is approximately 25 km long and will include the Alborz tunnels, each 6,350m long. Section 3 connects Pol-e Zanguleh in the Kelardasht District, to Marzanabad with an approximate length of 46 km. Our reinforced soil retaining wall is located in section 1, between km 14+620 and 14+980. Due to the topographical and geotechnical specifications of the region, and to the dimensions of the wall, which is up to 33m high and more than 300m long, a bridge or a concrete wall solution were found to be too costly. The installation has started in November 2016 and completion is expected in October 2017. Once completed, a Terramesh System facing area of 7,500m² and 90,000m² of ParaLink 300 will be installed.